This article was written by a British revert, living and working as an academic and freelance journalist in Bogota, Colombia. He first wrote for Productive Muslim in August 2013, following his first and second Ramadan, spent on his own, in Spain and Poland in 2013, and in Spain and China in 2012. Now in 2014, and perhaps in the strangest of places, he has found a community of Muslims at Bogota’s Mequita Estambul. They instruct and care for him in the gentle manner of the Prophet Muhammad . Those at the mosque are, however, not without their daily struggle (and blessings), as they too, try to be productive Muslims, very much on their own. This is their story, told through the words of their Egyptian sheikh Abu Hasan, as well as the mosque director, Carlos Sánchez, his wife Nur, and their son Jamid Said, who having learnt Arabic at an Islamic school in Trinidad and Tobago, translates Friday prayers into Spanish. Kai: Could you tell the readers at Productive Muslim a little about our mosque? Abu Hasan: We are a Sunni mosque that caters to the needs of both women and men. The women pray upstairs and the men downstairs, in rooms of equal size. The mosque was established, as a concept, 33 years ago by the director, Carlos Sánchez. It physically began as an office with 10 people and continued to grow until it reached what it is today. 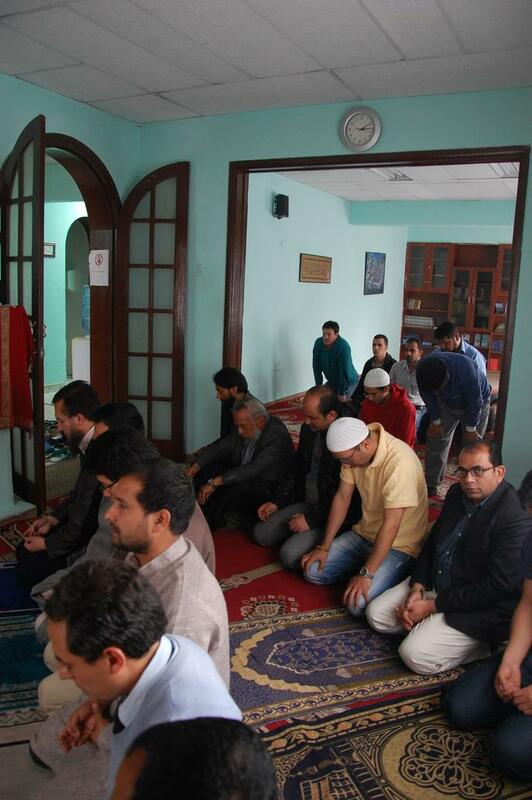 About 80-100 people come through our doors on a weekly basis, most of whom come to attend Friday prayers. The gender split is 50/50. Children come with their parents. Most of our congregation is composed of Colombian nationals, but many like you and me, come from further afield. I came here 12 months ago. Before coming to Colombia, I was an Islamic teacher and the leader of a mosque in my home country. I was asked to come to Mezquita Estambul by my government as Carlos, the director of the mosque, had requested that an Egyptian come to Colombia to lead and teach the Muslim community in Bogota. My government then elected me because I had scored highly on my Imam tests. I wanted to go because it was a unique opportunity to travel and practise da’wah (the call to Islam, proselytising) in a non-Muslim country. I wanted to learn about other countries, languages and people. Nur: We became recognised as followers of Islam by the Colombian government in 1997. At that point, we were a small Islamic centre. We converted our space into a mosque, so to speak, about 8 years ago when we moved to a bigger premise in Calle 45a 14-81. Please tell your readers our address, just in case any of them would like to visit us! Carlos: I have been practising da’wah for 33 years. I established the current mosque as an idea 18 years ago, as the one we went to before was not growing nor going in the direction we thought was closest to the Prophet’s sunnah (the “path” or “example” of the Prophet Muhammad, i.e., what the Prophet did or said or agreed to during his life) . Firstly, its location, along with the traffic of Bogota, meant that the brothers and sisters could not get there. We also had the problem that there were levels of discrimination between the small community of Middle Eastern immigrants and the Colombians. There was, for example, a refusal to speak Spanish and that caused a major communication problem. There was also the additional problem of erratic opening times, which meant the community was unable to grow. The only definite opening was on Friday for jumu’ah (Friday prayer). So I decided to offer a mosque in my office, where I still work. Various people came and we really needed a more suitable place. Nine years ago, some Turkish Muslims offered the Bogota community the money to buy a suitable location. The congregation of my office slowly moved to the new home. The first Friday we only had four men (Jamid, my son, and me, along with two more). Word spread and although we had some issues with jealousy and unnecessary conflict with those we had left, by Allah’s grace, we grew! Every believer is free to come at every prayer time and speak their language, Spanish of course! The later addition of two mosques have changed things radically. Now we have a sizeable place of worship, where we build our community. If any brother or sister needs help, we try to feed them or give them a place to sleep, even with the few resources we have. All in the name of Allah of course! Kai: What are your roles and responsibilities in the mosque? Carlos: My wife and I are full-time lawyers, but we believe Islam is more important so we organise our time around the needs of the community. I talk to the men when they have an issue or a question. My wife talks to the women. I respond to the various requests by universities and schools to visit them and explain Islam. Nur: My main role is da’wah with the women. I also organise the kitchen and food every Friday and help my husband with the finances. Abu Hasan: Now that my Spanish is improving, I help Carlos and Nur with da’wah at the schools and universities. My wife and I live in the mosque with Jamid and we all help with cleaning and maintenance. Jamid Said: I am the official translator. I help with the conferences at the universities and schools. I also translate when we have visitors from Malaysia or Pakistan, for example, since I speak Arabic, English and Spanish. Kai: How does the community maintain its spiritual and productive activities that form the basis of the siratul mustaqeem (straight path)? Nur: After khutbah (the sermon at jumu’ah prayer), all the women come together to discuss Islamic topics. The women who have known Islam longer share their knowledge with those who have only just taken their shahada (Islamic declaration of faith). It is important that we, collectively as women, know our religion and that we are not ignorant. As women, the way we dress in Colombia with the hijab (literally ‘cover’) and long clothes gives us an excellent opportunity to do da’wah. The people of Bogota are very inquisitive and like to ask us things on the street about our religion. We must always be ready to give a truthful and Islamically-correct answer. If we do not know about our own religion, then we have missed an opportunity to tell people who do not know about Allah , the Qur’an and his prophets . We simply cannot afford to be uneducated in these matters; other people’s lives depend on it! That is also why Sheikh Abu Hasan provides every Muslim brother and sister the opportunity to learn Arabic, on Sundays, without payment. Jamid Said: Yes, the Modern and Classical Arabic lessons are very important. Our brothers and sisters can learn to read the Qur’an as it should be read. With Arabic, they are able to listen and understand the Qur’an and the sermon on Fridays before I translate it. They can satisfy their thirst for knowledge by aspiring to learn more. We as Muslims should strive for this. We also focus on teaching the importance of the Qur’an, the hadith (recorded saying or tradition of the Prophet Muhammad ), fiqh (Islamic jurisprudence) and the sunnah of the Prophet Muhammad . Kai: How does the mosque manage to sustain and construct a healthy and productive community of Colombian and non-Colombian Muslims? Carlos: It is a real challenge. Once someone takes his/her shahada, we look at the difficulties or challenges that the person may face in following the new path. We discuss the situation of his/her family, work and studies to see how we can best help him/her to fulfil his/her duties and obligations to Islam. We teach them how to read the Qur’an and how to perform salah (any one of the daily five obligatory prayers). We offer free Arabic classes. Where applicable, we explain to the partner about Islam and how they can help the person in fulfilling their obligations. When a brother enters Islam, it is not long before we see the wife reverting too. In the few cases we have had of a sister finding Islam, her husband too followed. In the case of children, well some of the mothers have converted too! When I ask why, they often point to the good changes they have experienced since their partner or child reverted to Islam. Word of mouth is how our community has grown. We don’t have any form of media channel to express ourselves. There is no television channel or radio station. We don’t have the money to give our congregation literature that will enable them to become better Muslims. All praise be to Allah that he guides people to our door. As you know Kai, we have no funding for adverts either. All our media exposure has come through you, may Allah guide and bless you. You have given us a voice through your appearance on an expatriate radio, for example, your interview of Abu Hasan for the local expatriate newspaper and of course, this interview for Productive Muslim. We hope that your help, In sha Allah (if it is God’s will), will help us grow. Jamid Said: In sha Allah. In terms of maintenance of the community, however, we at Mezquita Estambul focus hard on jumu’ah. We explain to all Muslims, and even non-Muslims, like the school kids and university students who come in their groups, to learn about the way of Allah and His prophets , and the obligations such as the five prayers. We explain to them the significance of Fridays and why we are called by Allah to attend. For this reason, the women at the mosque offer those brothers and sisters who do make the journey free food and drink. We know in Colombia it is not easy to be Muslim. People can find it difficult to leave their workplace, especially as the mosque can be very far and the traffic is terrible. Furthermore, their bosses and colleagues, due to their lack of understanding, can impose restrictions. But we do try to lighten their burden. Kai: How do the universities and schools know about Mezquita Estambul? Jamid: My father, Carlos, has been a Muslim for 30 years in Bogota. He has been building up relationships over time. He and I, along with my mum and the sheikh’s wife, are actively teaching and holding seminars in universities and schools. Kai: Considering Bogota is not a Muslim city, nor does it have exposure to Islam, like say other big cities such as New York, London or Edinburgh, have any of you experienced or heard of any form of prejudice or discrimination? Nur: Alhamdulillah (praise be to God), here in Bogota, Colombia’s capital, we have not been subject to any form of discrimination or received any negativity because of our faith. That said, sisters in Medellin, Colombia’s second-largest city, told us they experienced some problems, such as people taking their hijab off their head and insulting them. We visit them on occasion and they come here. In July, just before Ramadan, there will be a Muslim convention here in Bogota. We are not sure of the numbers as we are not organising it, but we expect brothers and sisters from all over Colombia to attend. Abu Hasan: I must say I have been treated extremely well and am respected by the people living in Bogota. Everyone, Colombians and non-Colombians alike, has been very patient and kind to me. I can truly say that I have found rest and peace in Bogota. The non-Muslims of Bogota accept, without prejudice, that Islam is alive and well in their capital. No one has ever been rude or caused a problem. No Muslim I know has ever reported any form of abuse. I know that this is not always the case, elsewhere in the world. We even have tension between Christians and Muslims in Egypt, where I am from, but we all live peacefully here, which is nice. Jamid Said: I would say some 30% of the Muslim population here in Bogota are foreigners. Here at Mezquita Estambul 80% of us are Colombians. Generally, the immigrants come from Pakistan, India, Bangladesh, Syria, Egypt, Tunisia, Turkey, the US and UK. The last census, which was 10 years ago, stated that there were 2,000 Muslims in the city. However, we know that this figure has grown substantially with the opening of two more mosques since then (there are now four mosques) and we have greater numbers in our own mosque. There is, however, little outside of the places of worship to support the Muslim community. There is only one halal (permitted) food restaurant and no halal butchers. We do have Middle East-style shops but they are not Islamic. We cannot buy miswaks (natural equivalent of a toothbrush), for example, or Islamic clothes etc. We rely on ex-community members to send such things from their country of origin. Kai: Yes, being Muslim in Colombia is very different from being Muslim in countries where Islam has a much bigger presence. Can you explain some of the challenges you face in following the way of the Prophet Muhammad , here in Bogota? Carlos: The first is how we as Muslims and Colombians battle the media image of drugs, war and crime. This image that is sent all around the world has stopped us from getting access to key resources. We basically have to fight the stereotype that as Muslims we are terrorists and as Colombians we are guerrillas. This has unfortunately prevented our small voice from being heard. When we are heard, people listen, especially when they find out we love Isa and Maryam . That said, we are not recognised and supported by our government like the Catholics are. No money comes through our doors, except that from Allah . We are very much alone. We would like to be able to proclaim the good news to everyone in Colombia. Yet, we don’t even have the funds to feed all the Muslim brothers and sisters who come through our door in the holy month of Ramadan. We feel very sad about this. After we pay the water, gas and electricity, seeing as our building is located in strata 4 (middle-to-upper classes pay more tax under Colombian law) we have nothing left, apart from the small amount we give to provide food to everyone on Fridays. Our congregation does not provide any real form of “tithe”. Many are new Muslims. We are teaching them Islamic values and behaviour; they are hungry to learn, but this takes time. We would like to give our congregation more information to take home, but that requires money that we do not have. The mosque was improved by Egyptians last year who gave us curtains, so we’d have more privacy. They rebuilt the wudu’ (ablution) area and helped us better separate men and women. Before, we just had a curtain but now men are upstairs and women downstairs. Alhamdulillah, we also have separate toilets. Now the women outnumber the men (men are around 30 on Friday, women 50). Money is a real challenge, but it’s the resources we need as there is no way of getting hold of Islamic items here. As you know, Kai, we open our doors to any Muslim in need. We give them food and shelter and ask for no payment. We reach out to anyone who believes that Allah is One and that Muhammad is His messenger. We only turn away those who do not try to follow the straight path. We teach good solid values about how we should uphold the sunnah. Even what little we had was stolen by a foreigner who claimed to be Muslim. He took our projector that we used to educate the many universities and schools that come here to learn about Islam. It is not the same without the projector as small children really liked it and connected with Islam better. Our da’wah is being affected. We would like to have the ability to tell people about our plight and we would like other Muslims around the world to hear about us and know how hard we are trying to survive with so little. We want to show all people who ask that Islam, as a religion, is beautiful and an easy way of life to follow. Indeed, its simplicity is testament that it is the only true way to God. Jamid Said: This is true. The biggest challenge within the Muslim community, is persuading those who admit that Allah is One and that Muhammad is His messenger, that Islam is not a “Friday” thing. It is an everyday “thing”. It is all the time. It is a way of life, not a philosophy. It is the true religion. We try to teach Muslims to see their religion as a constant by educating them and building community and friendships around them. Nur: Our challenge as strong Muslim women is to explain to non-Muslim women that our religion does not imprison us, but liberates us. We must educate women that our clothes are a reflection of our liberation and not forced upon us by our husbands or parents. In addition to what religion I belong to, I get asked about the reason I dress this way when I walk with my hijab, at least three times a week. This gives me a great opportunity to show women that we have made an educated choice to follow the will of Allah day by day. After all, it is Allah who very much promotes women’s rights, values and education. Kai: That is very difficult to hear Carlos and yes Nur, I know what you mean. The women in our mosque remind me of the first Muslim women when they were called to cover themselves, as they went out to find sheets and anything else suitable to protect their purity, as per this hadith. The women here are, in many ways, a testament to the good teaching and humility that I have experienced here in Mezquita Estambul. Apart from the creation of strong believing women, what other accomplishments have you had here and what do you attribute to that success? Nur: We have always put Allah ’s gain before our own. We are not here for any form of personal gain. We are here to show through our words and actions the way of Allah and his messenger . That is why Allah has allowed us to grow. Carlos: I think the answer is sincerity. One must be sincere with Allah and help people in their faith, so as to make space for them so they feel they belong to Allah and our community here in Bogota. Allah should never be replaced with money, fame or our own personal desires. Staying true to Allah is staying true to real meaningful success. Jamid Said: The key is persistence, being consistent and never giving up, mixed with faith. Kai: I cannot argue with that. I guess it is the same with Ramadan! Jamid, could you tell us a bit more about Ramadan in Colombia? Jamid Said: Well, most of the congregation come together to eat iftar (meal eaten by Muslims breaking their fast after sunset during the month of Ramadan) and pray taraweeh (extra prayers performed at night in Ramadan). They arrive tired and feel a little “lazy” after having fasted all day. It is our job to encourage them to continue! For some, the first Ramadan is particularly difficult. We try to help them by showing them how to organise their day and which activities and food (before Fajr and after Maghrib) they should eat. If they are really exhausted we try to encourage them not to give up, but part fast until they have the strength to complete a whole day again. I know Kai how you mentioned the altitude issue but the Colombians here do not have that problem. Actually we have a problem when we go to lesser altitudes and fast! Our biggest problem in the mosque is accommodating the numbers we normally only see on a Friday, every day for a month. We feed everyone. Many do not have the money to offer us financial help. My parents and I subsidise out of our own pockets. We are of course in the developing world, where half of all Colombians earn less than a dollar a day! As a result, most do not pay zakat (alms) simply because they’re unable to. Even though new reverts struggle with fasting, Ramadan is a special moment for every Muslim in Bogota. The hardest thing for them is the “come down”, you know when it is finished! They really do not know what to do! They have a real hunger to learn but it is far from easy for some of them to follow Ramadan as they should all the time. Kai: I wish they could read English, as I wrote about fighting the emptiness after Ramadan last year. In sha Allah Productive Muslim will start a Spanish version one day, to tackle some of the unique issues we have here in the Hispanic world. 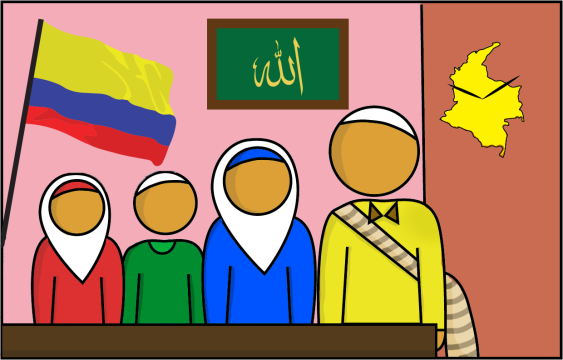 Colombian Muslims certainly need Productive Muslim duas. Sheikh, could you tell us a little about Eid? Abu Hasan: Eid is very special. The Muslim women are very generous with their time and their cooking. There is so much food! We spend 300 pounds that day to make the mosque look pretty. Carlos often pays out of his own pocket as we do not, as a mosque, have the funds to celebrate the way we would like to. However, it is important that we as Muslims follow the way of the Prophet [saws] and take Eid seriously as a day of celebration. Last year we had 70-80 Muslims and their children. We converted the Arabic classroom into a games room and all the children played together. I was so happy to see this! Kai: I really cannot wait; last year I was sick in Poland and could not enjoy Eid! Any last words? Abu Hasan: All readers of Productive Muslim, who want to be more productive while visiting Colombia, are very welcome to come here, to learn more about Islam and to share prayers and food with us. We hope, if and when you come, you feel that you belong and that you are happy and comfortable. We aim to make you feel like an important member of our small but growing community. We hope that you yourself, grow in Islam and as a person, and in doing so, you are able to support us in reaching out to more people and telling them about our religion.